The county's insurance is coughing up a massive settlement for putting these innocent men in jail for nearly 5 years. In the five years since these men were released from prison — their convictions and decades-long sentences overturned — they've worked to rebuild themselves. Robert Larson is working as a drug and alcohol rehab counselor, he says, and is focusing on raising his three children. Paul Statler has a 2-year-old of his own. He says he's working with a publisher on a children's book, but finding other work has been difficult, in part, because of the 2009 wrongful conviction. Tyler Gassman is a drywall hanger, though he says that steady work has been hard to come by. Despite the hardships, each of the men speak optimistically of their futures, especially in light of a recent settlement with Spokane County. A preliminary agreement nets $2.25 million after the men sued in federal court for violations of their civil rights. The lawsuit named the county and two former Spokane County Sheriff's Office detectives and alleged "reckless" police work and witness tampering in their case. 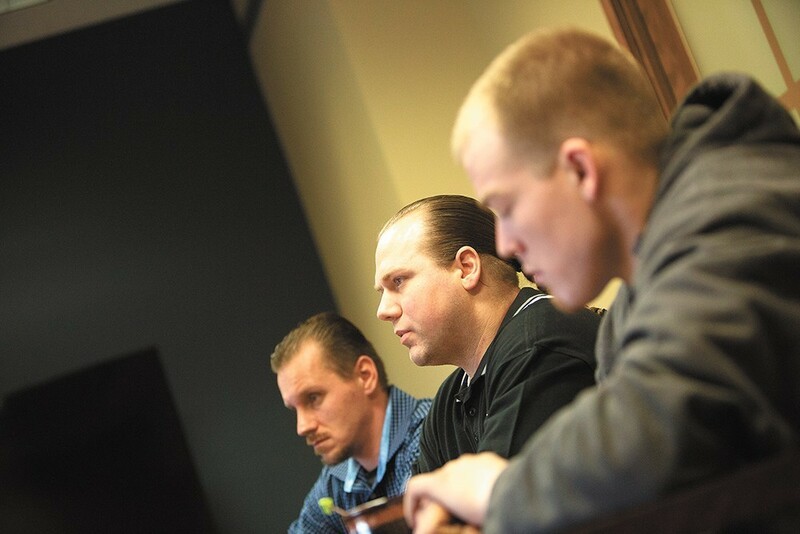 Statler, Gassman and Larson were convicted of armed robbery in 2009 on the word of a 17-year-old jailhouse informant, who received a light sentence in exchange for testifying. Their story was the subject of an Inlander report titled "Reasonable Doubt" in 2010, and the Innocence Project Northwest ultimately took up the cause. The men were finally freed from prison in 2012. Spokane County Judge Michael Price, in his ruling reversing the bad convictions, scolded the men's attorneys for failing to uncover holes in the case. A Sheriff's Office internal investigator also said in a deposition that the detectives turned in "extremely poor police work." After news of the settlement first broke, Spokane County Sheriff Ozzie Knezovich said the case should have gone all the way "to the U.S. Supreme Court if necessary." "They had no case, and that is evident in that they received $750k each," Knezovich says by text message. "A case like this is valued at $15-20 million each if true." In sworn testimony ahead of the settlement, Knezovich defended his detectives' work, saying that a thorough investigation is "subjective." He also says he believes the men are guilty and that they should have been charged as part of a larger robbery crew. "In my opinion — and I'm not the prosecutor — you throw all these cases together in a criminal conspiracy," Knezovich says in his deposition. An attorney representing the men in their claim for compensation under Washington state's wrongly convicted persons law says the sheriff should apologize. "Ozzie Knezovich's commentary on the Larson matter is dangerous, reckless and ostensibly intended to undermine the detailed factual findings of a well-respected Spokane County jurist who, as opposed to the sheriff, actually listened to live lay and expert testimony," attorney Mack Mayo says by email. "I believe that the sheriff is under an obligation, as a public servant, to apologize to these three innocent men." Bob Dunn, a local attorney who's had success in lawsuits against the government, says a defamation claim against the sheriff would be difficult to prove. "Especially for someone in the law enforcement arena, it's a tougher standard for proving defamation," Dunn says. "You have to show actual malice." In the men's case against the state, Spokane County Superior Court Judge John Cooney ultimately ruled that the men are "actually innocent," and are therefore entitled to money under state law to the tune of about $750,000, attorneys say. Their case is the first to be tried under the law enacted in 2013, which awards $50,000 per year to those wrongfully imprisoned. It's unclear whether the three men will get that money, though, as Washington's statute says individuals must waive their right to sue in order to get paid.